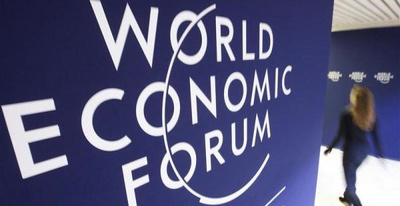 For the ones who might not know, The World Economic Forum (WEF) is a Swiss non-profit foundation, based in Cologny, Geneva. Recognized by the Swiss authorities as the international institution for public-private cooperation. Its mission is cited as "committed to improving the state of the world by engaging business, political, academic, and other leaders of society to shape global, regional, and industry agendas". 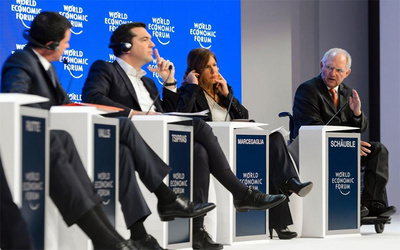 The Forum is best known for its annual winter meeting in Davos, a mountain resort in Graubünden, in the eastern Alps region of Switzerland BUT this is not the only forum organized by the WEF. The organization also convenes some six to eight regional meetings each year in locations such as Latin America and East Asia, as well as undertaking two further annual meetings in China and the United Arab Emirates. Beside meetings, the foundation produces a series of research reports and engages its members in sector specific initiatives. Saying these what makes the WEF meeting in Davos so special is: location, location, location. In other words, Switzerland. In the heart of Europe, the economic mega-centre of the world, in the boarders between west and east and in neutral – at least in theory – Switzerland. One more thing many ignore is that WEF was founded in 1971 and it has 41 years of history behind it. But the first decade the forum was true to its role, a forum that engaged business, political, academic, and other leaders of society in a dialogue about regional problems and science. In the end of 1970s it was when the forum started changing. Mapped in the centre of Europe and staged in neutral Switzerland, the place where most international organizations operate, WEF meeting in Davos became the convenient place for political leaders to meet and openly talk about little and bigger conflicts. To be exact it was the Middle East issue the first to change the founded path and eventually put Davos in the centre of all WEF actions. The middle east because that time it looked like that any other mediator was failing and Israelis with the Palestinians were embraced in a never-ending conflict with no hope for solution. Suddenly the forum had a very specific agenda that gradually became the focus of all activities. Not that the side forums didn’t matter - I had the chance to follow an incredible conversation between Bill Gates and Rupert Murdoch in Davos a few years ago about the future of typography that I will never forget – but politics took over the main stage. The last decade, first with the euro-crisis, later with the possible Greek-exit and lately with the refugees’ problem, Europe had come in the centre of the forum and it looks like European politicians and policies monopolize the meetings. Oddly Greece had become the constant reference, never for good reason. Having followed three forums in Davos the last thirty years I have to admit that there are two sides to what you hear in the main stage and the main issue of the forum. First it is politicians expressing wishful thoughts while they try to explain their policies (implemented or for the future to implement, depend if they are ruling or they are part of the opposition); most of the time looking for support between major European political personas or financers. Then it is country leaders trying to promote their side in regional, economic or geopolitical conflicts. The Turkish president, Recep Tayyip Erdoğan, is the best example of a leader who has stood in both sides. Actually what you learn following these forums is to watch and understand what hides behind everything these people say. There is always something, something that wouldn’t be easily acceptable and it’s well covered to make it look political and socially accepted, hoping that the right ears received the message. Returning to the Turkish president, Erdoğan has mastered the art passing the most incredible messages through those forums the last decade. From warnings to everybody to stop embracing the Kurds doesn’t matter what to his geopolitical dreams for the rebirth of the Ottoman Empire. This year it was the German Finance Minister Wolfgang Schäuble who said everything in one and only sentence. Paraphrasing the Bill Clinton’s campaign slogan: “it is the economy, stupid,” the German Finance Minister said answering to the Greek Prime Minister, Alexis Tsipras in a panel about the future of Europe: “it is the implementation, stupid.” And somehow he said it all. Despite personal differences with chancellor Merkel, Wolfgang Schäuble represents with her a very twisted European new conservatism which obviously has found strong followers in Germany’s satellites, east Europeans and most conservative parties all around Europe. This new conservatism combines traditional conservatism, Prussian bureaucracy and controllable social-democrat welfare state, in a short of conservative way. Far away for example from the American Republicans who are dreaming a state where money rule. Not a fan of conspiracy theories I like to believe that Mr Wolfgang Schäuble doesn’t serve certain economic interests with material exchanges but and this is a huge but, certain economic interests profit highly from Mr Schäuble’s plans and this is why the strong support from them and this might answer why Mr Schäuble despite often mistakes in his career, he often survives in high and fundamental positions in German politics the last three decades. Mr Wolfgang Schäuble said that as the leader of Europe, the strongest by far economy with the highest growth, Germany knows where the future of this continent lays, what is the left is to find ways to implement it, the implementation. And the ending “stupid” was well put because he knew that Mr Tsipras will be insulted – even though he never admitted it and he will never will – because in the eyes of the European left, Mr Tsipras despite his defeat he still looks like the other side. 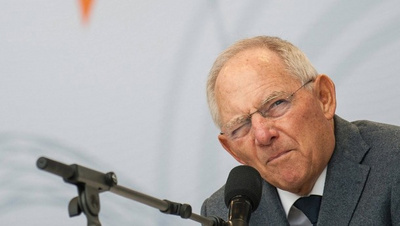 The resistance to a raw capitalism, Mr Schäuble represents. Even the refugees problems in Europe seems elementary to Mr Schäuble. We use as many we need as cheap labour after fully assimilate them and the rest …well is something Greece can short out with neighbour Turkey. The threat for that – because again it was a hidden threat - came from a different direction. The Hungarian prime minister Viktor Orbán - well known anymore for his far-right attitude, often fascist behaviour and ruling over Hungary – called the countries around Greece to rise walls, stop immigration under any cost adding in the end that “a good immigrant is the one who doesn’t reach the Hungarian borders.” Again the target is obvious, an isolated, all Christian, definitely white, racist and prejudice Europe. The problem is in the implementation and not the result. The east European states should have never become full EU members. None of them was even close to the EU criteria and the “because” and “whys” we see them now. Poland, Hungary and Czech Republic with Lithuania and Slovenia following close, they are anything than democracies in the way the rest of Europe identifies a democracy. They are closer to banana republics with constant violations of human rights, freedom of speech and prejudices against minorities. Latvia, Bulgaria and Romania thrive corruption and Estonia’s democracy has citizens of A and B category. Still they are in EU, they are full members of EU and they fully imply and follow the German plan. 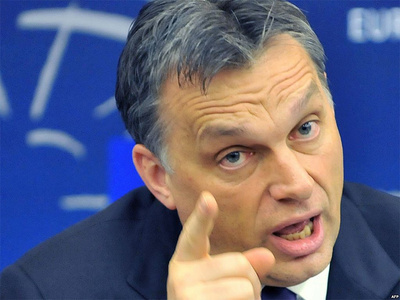 While EU is preaching China about freedom of Speech and applies measures against Iran for the very same reason Viktor Orbán, one of the EU’s leaders sends to prison anybody who dares oppose his dreams for the new Hungary. While we preach Russia about discrimination and we actually implement sanctions for this reason we let Poland treat Roma people like they are not humans. But all of them serve a cause. The implementation, stupid! For Mr Schäuble the implementation demands sacrifices, no questions asked and obedience. Mr Tsipras failed big in his opposition to these new-conservative plans but he still remains a reminder that there is some kind of opposition and on his way to implement his plan, Mr Schäuble hasn’t got the luxury every so often to deal with the Tsipras of this continent. Especially now with the Podemos in Spain rising. So he had to make it big, to pass the message. That’s why he ended with the unnecessary “stupid” knowing too well to whom he was addressing it and why. A new Europe planned by Mr Wolfgang Schäuble and Ms Merkel’s new-conservative cronies and implemented by Mr Viktor Orbán and his allies? It’s a nightmare. A nightmare that will make even 1936 in Germany look like the belle époque. A future none of us wants to see. Because this is not Europe, dangerous stupid! Indeed, the implementation of Europe supposedly has been going on since the Treaty of Lisbon was pompously proclaimed as a EU Constitution by its visionless politicians, a theoretical underpinning of sorts. It misguidedly assumed that the New Europe had been made, built on solid political and economic foundations and what remained to be done was to merely implement its secular economic-political provisions as spelled out in the Treaty. What in fact remains to be done as we speak is to find the real identity of Europe as envisioned by its founding fathers, but nowhere to be found in the Treaty; recover its ideals, or its soul, so to speak, and then announce to the people a real Constitution based on such an identity; an identity they will be recognizable and acceptable to the people. Christopher Dawson, of Making of Europe fame, must be turning in his grave. Could he speak to our deaf politicians, he would probably remind them that it is imperative to first make a people and then make a polity and to proceed otherwise is to run the risk of ending up with the cart before the horse, stupid!